This article is about naturally occurring rock formations. For human-created art using rocks, see Rock balancing. A glacial erratic is a boulder that was transported and deposited by glaciers or ice rafts to a resting place on soil, on bedrock, or on other boulders. It usually has a different lithology from the other rocks around it. Not all glacial erractics are balancing rocks; some are firmly seated on the ground. Some balancing erractics have come to be known as rocking stones, also known as logan rocks, logan stones, or logans, because they are so finely balanced that the application of just a small force may cause them to rock or sway. A good example of a rocking stone is the Logan Rock in Cornwall, England, United Kingdom; another is the Trembling Rock in Brittany, France. A perched block, also known as a perched boulder or perched rock, is a large, detached rock fragment that most commonly was transported and deposited by a glacier to a resting place on glacial till, often on the side of a hill or slope. Some perched blocks were not produced by glacial action, but were the aftermath of a rock fall, landslide, or avalanche. An erosional remnant is a persisting rock formation that remains after extensive wind, water, and/or chemical erosion. To the untrained eye, it may appear to be visually like a glacial erratic, but instead of being transported and deposited, it was carved from the local bedrock. Many good examples of erosional remnants are seen in Karlu Karlu/Devils Marbles Conservation Reserve in the Northern Territory of Australia. A pedestal rock, also known as a rock pedestal or mushroom rock, is not a true balancing rock, but is a single continuous rock form with a very small base leading up to a much larger crown. Some of these formations are called balancing rocks because of their appearance. The undercut base was attributed for many years to simple wind abrasion, but is now believed to result from a combination of wind and enhanced chemical weathering at the base where moisture would be retained longest. Some pedestal rocks sitting on taller spire formations are known as hoodoos. 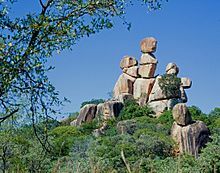 The Balancing Rocks are a geological formation found in the township of Epworth, southeast of Harare, the capital of Zimbabwe. It is a formation of rocks perfectly balanced without other supports. The Mother and Child balancing rocks are a well-known feature in Matobo National Park. Krishna’s butterball is a famous balancing rock located in Mahabalipuram, India. A balancing rock is located near Madan Mahal fort in Jabalpur city of Madhya Pradesh. A balancing rock, popularly known as Mama Bhagne hills situated in Dubrajpur in the state of West Bengal. Karlu Karlu / Devils Marbles Conservation Reserve is a vast field of erosional remnants. The boulder, which gleams golden and popularly known as the Golden Rock on which the small Kyaiktiyo Pagoda has been built, is about 25 ft (7.6 m) in height and has a circumference of 50 ft (15 m). The boulder sits on a natural rock platform that appears to have been naturally formed to act as the base to build the pagoda. The Brimham Rocks are a group of outstanding pedestal rock formations in North Yorkshire. Kummakivi is a balancing rock located at 61° 29' 36.4596" N, 28° 25' 45.5016" E in Ruokolahti and is protected. Chybotek – granite balancing rock in Jizera Mountains (Góry Izerskie). A tall basalt stack appears to balance precariously above the water near Digby, Nova Scotia. Located near Bear Beach on the Juan De Fuca Trail, this solid rock is perched upon eroded sandstone. Several pedestal rocks are found within the boundaries of the Chiricahua National Monument, and two are easily accessible in Marble Canyon, between Navajo Bridge and Lee's Ferry. 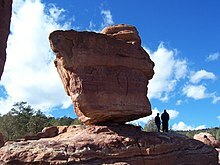 A large balancing rock may be easily seen at D.L. Bliss State Park on the west shore of Lake Tahoe. A huge sandstone boulder hangs precariously near the roadway in Garden of the Gods park near Colorado Springs. A glacial erratic rests on the edge of a precipice on a mountain in Acadia National Park. In Balance Rock Park, in Pittsfield State Forest, a field of massive boulders left on a hillside by receding glaciers is crowned by Balance Rock, a tremendous rock balancing almost unbelievably upon a smaller rock protruding from the ground. Several sites around the state, including the Bisti Badlands, Kasha-Katuwe Tent Rocks National Monument, the Ah-Shi-Sle-Pah Wilderness, Chaco Canyon National Park, Red Rock State Park, and in private and BLM public lands throughout New Mexico . The Devil's Head is a large boulder perched on the ledge of a cliff in the Chimney Rock State Park, North Carolina. Balanced Rock (also called Window Rock) is a large boulder suspended between two pedestals in the Grapevine Hills of Big Bend National Park. One of the most visited formations in the United States is the Balanced Rock in Arches National Park. A large glacial erratic is at the south end of Omak Lake in Okanogan County, known as the Omak Rock. Located in Devil's Lake State Park. A big rock near the top of a trail with the same name with a view on the lake. ^ David Haddad. "Nature's Balanced Seismometers". Retrieved 18 February 2010. ^ India, Mystery Of (2014-10-19). "Krishna's butter ball - A Balancing Rock at Mahabalipuram". Mystery of India. Retrieved 2018-10-07. ^ "Balancing Rock near Madan Mahal, Jabalpur - Picture of Balancing Rocks, Jabalpur - TripAdvisor". www.tripadvisor.com. Retrieved 2018-10-07. ^ "BALANCING ACT". March 4, 2010. Retrieved October 3, 2017. ^ "Karrta Paikka" (in Finnish). National Land Survey of Finland. Retrieved 1 December 2013. ^ Lehteinen, Markus. "Ruokolahden Kummakivi" (in Finnish). Retkipaikka. Retrieved 1 December 2013. ^ "Glen Canyon/Rainbow Bridge Park Guide 2013". National Park Service. 2013. Retrieved 1 July 2014. Wikimedia Commons has media related to Balanced rocks. This page was last edited on 19 March 2019, at 19:47 (UTC).